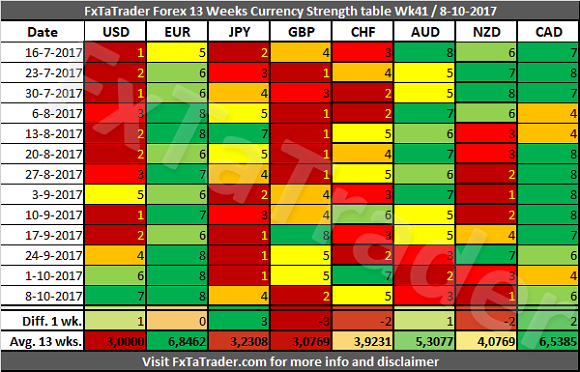 In the Currency Strength table, the EUR was again the strongest currency while the NZD was the weakest. There were some significant changes last week with the JPY gaining 3 points, the CAD gaining 2 points, the GBP losing 3 points and the CHF with the NZD losing 2 points. The other currencies remained around the same level of last week with a maximum change in the strength of just 1 point. The USD and the JPY showed a very strong performance at the end of the week against all the currencies with the USD being slightly stronger. These are weak currencies and may for that reason be difficult to trade as the stronger currencies in the coming week. The GBP and the NZD showed a very weak performance at the end of the week against all the currencies with the GBP being slightly weaker. These currencies fit exactly with their current performance in the Classification and Score that they have and may offer good opportunities to be traded against in the coming week. The EUR showed a stable performance during the week and remains strong for several weeks. This currency may offer good opportunities when trading against the GBP and NZD. 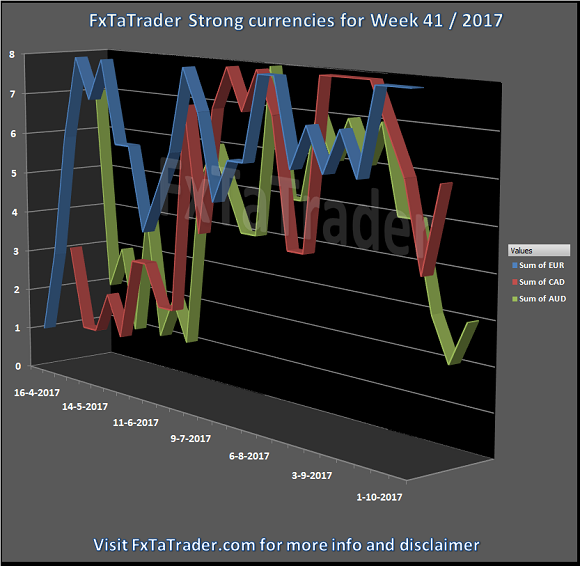 Strong - We can see that the EUR, AUD and the CAD are clearly grouped together as Strong currencies around an Average 13 wks. Score of 5 to 6. The EUR is the strongest currency and continues to deliver high Scores while the AUD, being a Strong currency, is showing a bit of weakness in the last 5 weeks and especially in the last 3 weeks with scores in the range of Weak currencies. Neutral - The NZD and CHF are grouped together around an Average 13 wks. Score of 4. The NZD is the weakest currency of this week. Weak - The USD, JPY and GBP are grouped together around an Average 13 wks. Score of 3. The USD showed again a lot of strength last week with a score of 7 but lost a lot of strength in the previous weeks and is the Weakest currency of all, this was the GBP for a long time. This week we take a look at the Strong currencies. We can see that the EUR has a very stable performance with high Scores. The CAD had a dip towards the Neutral range and seems to recover. The AUD is showing a lot of weakness lately but according to the Avg. 13 wks. it remains a Strong currency for now! 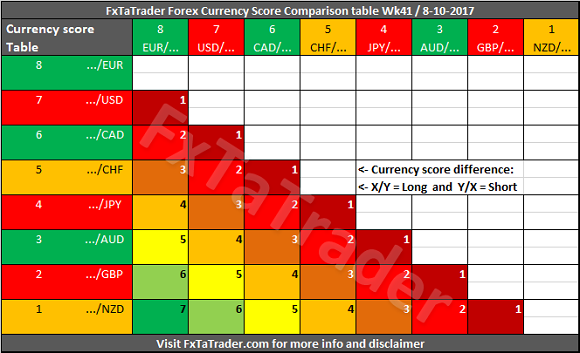 If the weak performance continues it will become a neutral currency in the coming weeks.Below you can see the Weekly Currency Score Chart with the 6 months' data as a reference. Strong: EUR, AUD and CAD. The preferred range is from 6 to 8. Neutral: NZD and CHF. The preferred range is 4 to 5. Weak: USD, JPY and GBP. The preferred range is from 1 to 3.